Most holidays worth their while encompass entire seasons, such as Christmas, for example. However, as you may have noticed there is a corporate push every year for us to think about the next holiday even sooner. While this has many negative side effects I figure I may as well embrace it. Since Labor Day is really only good for college football and movie marathons cinematically it is as significant as Arbor Day, which means the next big day on the calendar is Halloween and we can start looking toward it starting now. Daily I will be viewing films in the horror genre between now and then and sharing the wealth. Many, as is usually the case, will not be worth it so for every disappointment, I will try and suggest something worth while as well. Each year, since I’ve started doing 61 Days of Halloween anyway, I’ve selected a long-running horror series to view in its entirety in rapid succession. I’ve already done Halloween, Friday the 13th, Children of the Corn, Hellraiser and Final Destination. Now, whether I spawned write-ups or not on each individual film has varied, what it does serve is to track the trajectory of the series, to follow certain narrative threads, concepts and plot points through the series. A Nightmare on Elm Street is a series I should’ve done earlier. There is a a slasher trinity in 80s, it just stands as a fact whether I like it or not. 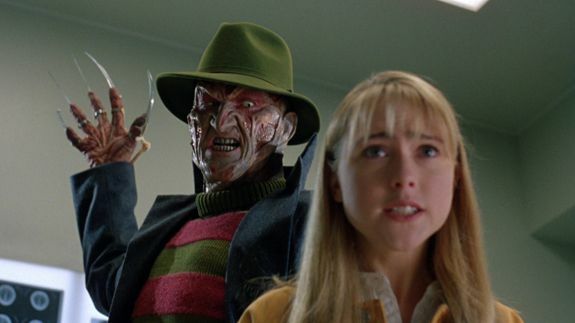 I’d peg the Nightmare on Elm Street series 3rd overall, and I still do having seen it all. Essentially, what it boils down to is that it’s a great, great concept that’s never executed to it maximum effectiveness. It’s a wonderfully perceptive joke by Craven. 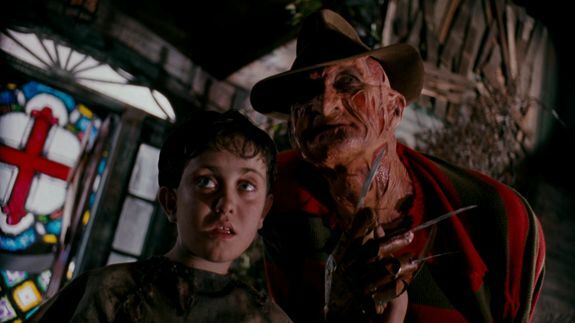 Over the course of the original series, Craven only is involved in the first two, Freddy becomes more frequently a vehicle for one-liners and clownishness. It ends up being the situation, and whether or not we have any sympathy or identification with the characters, that determines whether or not we’re involved. Freddy does have an arc in the series, which is gravitates towards comedy. Jason and Michael Myers stay virtually the same, we may learn more about them, but they as symbols do not change; they don’t speak, they rarely if ever show their face and they haunt in their same way. Perhaps the best thing about the Nightmare series consistently is that it does come of with very creative ways to have Freddy attack anew, or to explore a new aspect of the Dream paradigm. In a similar manner to the Children of the Corn series, the second Nightmare film is perhaps the most unfortunate and furthest removed from the intentions of the tropes established in the first. In this one, Freddy is able to lodge himself in his victim’s mind in his sleep and he bursts forth with a body anew whenever he takes over. It’s a symbiotic, quasi-Dark Half oddness that doesn’t befit the rest of the series. Similar to the Halloween series which follows Jamie Lloyd for a few films, there are the Alice Johnson movies in this series. Some under-served ideas occur in her films in both Dream Master and The Dream Child wherein you have very interesting concepts that don’t get the kind of films that live up to how fascinating the ideas folded into it are. Aside from New Nightmare, which flips the script literally, Dream Warriors is the best new ground covered. It reintroduces Nancy years later in a pretty great evolution of her character becoming a mental health professional with a unique insight to her young patients’ nightmares. Now, as I mentioned above, in ranking the iconic 80s-started series, I put Halloween above Friday the 13th and A Nightmare on Elm Street. I would do so anyway, but having the two other series involved in the farce that is Freddy vs. Jason doesn’t help. And, of course, the way that film ends, even taking it for what it is, didn’t please me in the slightest. So, the concept is great and was original upon its inception. In horror movies the “it was only a dream” escape was always a cop out. Here, in this series, there’s nothing more dangerous than dreaming. It’s not only a dream. That above all is most refreshing. Now, this film, like the other two iconic franchises of the 80s, has been re-imagiend for the 21st century. I already wrote plenty about it in my initial review, but it did find a new avenue to make sleep attack when you least expect it. It was also a set-up part one that could’ve been improved upon in part two. However, the good news/bad news is that apparently the pie is split too many ways to make a sequel financially desirable; so for the time being Freddy’s dead anew. If and when he’s resuscitated let’s hope his persona leans towards the remake, and that the film makes no apologies for his villainy and the dream concepts are fully enforced.